Nuno comes from a hands-on data practitioner background where he developed extensive experience in using analytics to inform, measure, and optimize processes on a variety of industries (B2B and B2C). Nuno has an entrepreneurial spirit with great passion for innovation demonstrated through development and enhancement of numerous successful projects. Nuno started his career as a Researcher in modelling carbon retention for the paper and pulp industry and later became a Data and Text Mining Consultant having worked across several verticals such as Police&Security, Manufacturing, Environment Sciences, Pharma, Energy, Mining and Insurance. In 2005 Nuno became Iberian Regional Manager for Statistica, running a team of with sales, technical and admin professionals. In 2012, Nuno moved to São Paulo, Brazil, to become Regional Manager for Statistica in South America, running a team spread across Brazil and Chile and partner networks in Colombia, Argentina, Uruguay and Ecuador. 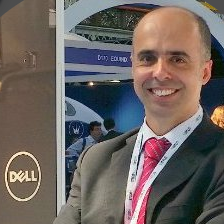 In 2014, Nuno joined Dell to be Senior Manager for Advanced Analytics leading the Data Scientists team in EMEA. My work as a Senior Manager was recognized during my time in Dell with a very high score as a Leader. He was also awarded MVP (Most Valuable Player) in 2015. Nuno is presently CTO for Analytics, Big Data and IoT for EMEA DellEMC the Commercial Presales team. Providing thought leadership on emerging technology trends across industries. Customer facing activities, either through though leadership workshops or engagement at an early stage of the sales cycle. Creating collateral, demos, and talk tracks for cross-BU solutions. Interfacing between the field and the Office of the CTO. Speaking on behalf of Dell EMC at industry conferences. Afternoon Keynote: The path to AI Transformation – How organisations are taking it.